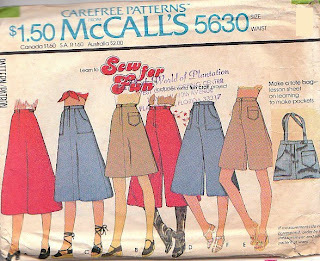 Patterns from the Past: Can't refuse reuse! In the past few years I have had discussions with Girl Scouts in my town about doing her Gold Award around having our town not use plastic bags. Another young Girl Scout asked me to sign a pledge to not use plastic shopping bags. Both girls got me thinking about all the bags I use for shopping. It took a few months, but I finally gave up my new bag addiction. I have a bunch of bags that fit nicely in my purse. I drive the store owners crazy by providing my own bags. The supermarkets are more used to the bags. I am happy to report that I got through black friday without acquiring a single new bag. I have very few plastic bags in the house to re-use, and none to throw out. It really took an effort at first, now it is 2nd nature. I think I've gotten my daughter in the habit too. Here is group in England (morsbags) supporting the use of reusable cloth bags. Do you want to make some of your own shopping bags to use up your fabric stash? 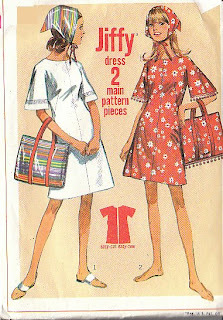 Try some of these vintage patterns! This one would look great in vinyl or a durable canvas. You do not have to add the pom-poms unless you want. This pattern shows you a interesting way to make a tote bag that looks like pants. 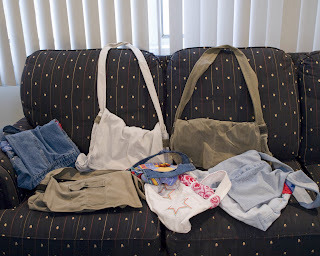 I thought it would tell you how to cut off jeans or a skirt to make it into a purse. No, this pattern has you cut out the pattern and make the purse from scratch. They are nice and don't have you insert the zipper. Last year, for my son's holiday fair, I created purses made from old jeans. They where based on instructions from Threadbangers. I was told they where not a hit. Not enough bling. I have a great messenger bag made out a chino pants. It holds all my cub scout items, and it looks great with my uniform. 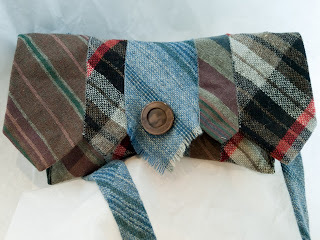 This year I made purses out of Men's ties. I have been told there where a hit. I have not had luck selling them on etsy. I love working with the different colored ties, the problem is due to their shape the inside of the purse is larger then the flap. What do you do for trash bags? I still use plastic garbage bags. I have just tried to eliminate getting new shopping bags while shopping.